1980: A young couple is strolling along the streets of a Swiss town. Now and then they stop in front of a shop window. In particular, the jewellery shops fascinate them. Next to them is a young beggar, almost a child, unkempt, in torn jeans. Her cheeks are hollow and her eyes are vacant. “A junkie!” they think and step back a bit. “Can you spare me a franc?” the young beggar asks. 1780: A man is on his way to Basel, on foot, wearing a worn-out coat. The man has money problems. He is carrying the manuscript of a book that he has written in the pocket of his coat. He wants to show it to a friend in Basel. In front of the city gate there sits a crippled beggar, stretching out his hand. The man rummages through the pockets of his coat, searching for coins. He does not find any. Embarrassed he looks down at the ground. He then sees the silver buckles on his shoes. He bends down, takes the buckles off and places them in the beggar’s hand. Then he looks for a few strong blades of grass in the field nearby and, as well as he can, ties his shoes with them. The man’s name is Heinrich Pestalozzi. Heinrich Pestalozzi was born in Zurich on the 12th of January 1746. His father made his living as a medical practitioner; when someone got hurt, he was called to clean the wounds and to bandage them. He also helped the local government, as a secretary, when the town clerk had too much to do. His mother was a fine, delicate lady. Henry had two siblings: Baptiste, who was one year older, and Barbara, who was four years younger. The family also had a maid, Barbara Schmid. Everybody called her Babeli. When Heinrich was only five years old, his father died. On his deathbed he said to Babeli, “Please, don’t desert my wife!” She promised not to and kept her promise until her death. She worked for the Pestalozzi family for forty-one years without pay. This loyalty impressed Heinrich deeply. Heinrich felt his mother’s love and Babeli’s tender care deeply. Nevertheless, he was missing something. He was a delicate but very lively boy. He could not sit still for a minute. He wanted to pick up everything and play with it. He was so over-enthusiastic that often he broke whatever he grabbed. Mother scolded him, “Can’t you sit still and keep your hands still?” Babeli did not even allow him to dry the dishes or light a fire in the oven. She was afraid he would break something. He did not have any toys. When he could no longer find anything to do, he would take a string and twist it until it completely fell apart, or he would tear apart a leaf or a flower. At home he was always being told, “Stop that!” Little Heinrich got very little physical exercise. He did not know any boys his age nor did he know any of their games. He was like a sheep that was never allowed to leave its pen. That is how he became a dreamer. In his imagination he pictured all the things he would have liked to play with and wanted to experience. Heinrich was relieved when he started school. At last he could do something. Of course, at school he also had to sit still for hours. But at least he could use books and writing material. During breaks and on the way to and from school he could play with his schoolmates. Like a river bursting the dam, he broke loose and went wild. No other child brought home so many bruises and scratches. Heinrich did not care. His playmates liked him because he was good-natured and always ready to help others. However, they often made fun of him because he was so clumsy. One of them nicknamed him ‘Heiri Wunderli of Torliken’ (roughly translatable as ‘Harry Oddity of Foolstown’); this nickname stayed with Pestalozzi for the rest of his life. To begin with, Heinrich’s performance at school was not very good. He often daydreamed and did not pay attention to what was going on. Sometimes he gave such inappropriate answers that the whole class burst out laughing. But when something touched his heart, he became enthusiastic and then even his teachers would be amazed by his achievements. This clumsy, delicate boy was braver than all the others; he was not even ten when an earthquake, which destroyed the city of Lisbon in distant Portugal, made the whole of Switzerland shake. The large church’s two towers swayed and a lot of chimneys fell off the roofs. Teachers and pupils fled helter-skelter from the school. Only one dared to get the books and school-satchels from the classrooms: Harry Oddity of Foolstown. Once he hopped along the town wall where it dropped vertically to the town-moat. Another time he galloped dangerously on a horse over a narrow footbridge. At the age of nine Heinrich moved to a secondary school where he could also learn Latin. At that time this language of the old Romans had to be learnt by all the students who later wanted to go into an academic career. He took great pains over his studies. At the age of fifteen he was the best in his class. He wanted to become a clergyman like his grandfather. Heinrich had a strong sense of justice. Once a teacher did not mark as wrong two mistakes on a classmate’s paper. Heinrich knew that this student’s parents had sent a present to the teacher. He thought the teacher’s conduct unfair and was very indignant. Another time the music teacher was drunk and tried to force Heinrich to learn the musical notes by using a cane on him. Heinrich pushed the teacher away and also pushed the boy who shared his desk out of the way and ran to the headmaster to complain. From then on he did not have to attend the singing lessons. At school Heinrich did not learn to work with his hands. At that time there were no subjects such as handicraft and there was no physical education. The children learnt to read, to write, to do arithmetic and to study old languages and religion. They only learnt from books, training their minds, so their hands remained unskilled. During his holidays and days off Heinrich mostly went to stay with his grandfather in Höngg. In those days Höngg was a small village near the city of Zurich. Today it has become part of the city. Heinrich’s grandfather was the pastor there. He often took Heinrich along when visiting people in their homes. What Heinrich saw there went to his heart. People in the country were extremely poor. They had to obey the masters from the City and had no say in anything. Jobs in which one might make good money were only open to the Citizens of the City. Heinrich saw a lot of children searching hungrily for something to eat. Many of them were sold to merciless peasants and died as a result of working too hard. Others had to spin cotton and weave on the loom in humid cellars, so that their families would not starve. Or, they had to work all day long in a factory, becoming pale and thin. Most could not learn anything. The few who learnt anything at all did so in an inadequate village school, and then only for a short time. Heinrich saw bands of beggars. At the beginning of every month the police drove them across the border like cattle. He saw how petty thieves were kept prisoner in foxholes, exposed to the rain, the cold and the mockery of the public. The misery that Heinrich met all over the rural countryside upset him profoundly. He could not bear it. “Something has to be done. I must somehow help these people,” he thought. This desire stayed with him throughout his life. At the age of seventeen Pestalozzi entered the Collegium Carolinum, which in those days was the University of Zurich. He no longer wanted to become a clergyman. He no longer took pleasure in formal ceremonies and pious talk. He wanted to be able to say openly what was on his mind. And since there was so much misery and injustice, he wanted to become a lawyer. “In such a position I can best help my country,” he thought. Whoever expressed such ideas was sure to be arrested and imprisoned. The government also controlled every printing press, so that nothing could be published that might harm its reputation. But the students would not be intimidated. They wrote their ideas down by hand and distributed the copies secretly. At one time Pestalozzi was under suspicion for editing an insurgent pamphlet. He was arrested and put in prison. However, the real writer of the pamphlet fled abroad and in doing so betrayed himself. Pestalozzi was released after three days. Nevertheless, he had to pay for the wood needed to burn the pamphlet in public. This did not bother him; while the stack of firewood was smoking heavily, he and a few friends watched from a nearby roof. He walked up and down, his hands behind his back, smoking a pipe as if all of this was of no concern to him. At this time, Pestalozzi was twenty-one. He had not finished his education and he had no profession. Then he fell head over heels in love. This is how it came about. One of Pestalozzi’s schoolfriends was called Johann Kaspar Bluntschli. Everybody called him Menalk. Kaspar Schulthess, the son of a rich confectioner, also belonged to their circle of friends. Now and then the students met in the house of the Schulthess family. On these occasions, Anna, Kaspar’s elder sister, enjoyed listening to their conversation. Anna and Menalk were friends. Menalk was a quiet man and had an exemplary character. 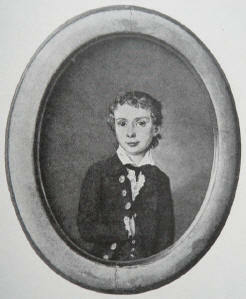 Then this young man fell ill with a serious pulmonary disease and died at the age of twenty-four. This deeply grieved Anna as well as Pestalozzi. Pestalozzi wrote Anna a letter in memory of their common friend. Anna answered and before long, and without realizing what was happening, Pestalozzi fell deeply in love with Anna and started to write her passionate love letters. Anna Schulthess was eight years older than Pestalozzi. She was a very beautiful woman, one of the most beautiful in Zurich. Her parents were very rich and distinguished. Accordingly Anna was very popular. There was no lack of suitors who would have loved to marry her. She was, however, cautious by nature and reserved. Therefore she was still single. Heinrich Pestalozzi was the opposite of Anna; he was ugly because an illness had disfigured his face; he had no money and no profession and his family had no prominence in town. His head was full of ideas of how to better the world but with his hands he could hardly drive a nail in straight. In addition there was another problem, Anna’s parents were very proud of their wealth and their position in town. They looked down on the simple people. The mother in particular was a hard and cold woman. Her sons, and her daughter Anna, got severely punished if they did not obey her. Even at the age of thirty, Anna still got beaten by her parents! She would never have revolted against her parents. She considered it her duty to obey them. There was no way that she would get married without her parents’ approval. “How could this work?” we ask ourselves. Poor Pestalozzi! Was an unhappy love not inevitable? How were Anna’s parents to be won over to such a son-in-law? Anna could imagine how shocked they would be. At first, she concealed her love affair from them. Heinrich also was not to tell anybody – not even his own mother. But in the long run they would not and could not keep their marriage plans secret. When the Schulthess parents learnt about them, they turned Pestalozzi out of the house, and he was told not to come back, ever. From then on the two lovers could only exchange letters secretly. Anna’s brothers were their allies and acted as go-betweens. Occasionally, they even helped them to meet in secret. In the two years leading up to their wedding almost five hundred letters went back and forth between Anna and Heinrich. Pestalozzi never tried to fool Anna. He wrote to her, “Above all, I have to live for my country. I pledge that I will always give my best for the good of my country, even if I have to leave my wife and children alone and even if I have to sacrifice my life to do so.” He suspected that great tasks lay ahead of him. A big stumbling block in the way of the marriage was the fact that Pestalozzi had no profession. He thought, “I should like to help people in rural areas to overcome their misery. Urban life is rotten anyway and makes people conceited and dishonest. I want to become a farmer. Then I can also feed my family.” In the autumn of 1767 Pestalozzi began his training as a farmer. His master was a well-known farmer called Tschiffeli. This man was familiar with the new methods of cultivation and grew new plants successfully. He shared his knowledge with Pestalozzi. The training lasted only nine months. By then Pestalozzi believed that he was sufficiently prepared to be able work his own farm. Pestalozzi wanted to buy land in Birr, a small village about twenty-five kilometres from Zurich, but from where could he get the necessary money to do so? He managed to persuade a rich banker from Zurich to back his farming project. The banker, whose surname was Schulthess, the same as Pestalozzi’s wife’s, lent him five thousand guilders. His mother was able to give him a further one thousand guilders, which she had secured from his father’s inheritance. With that he was able to buy twenty hectares of land and build a farmhouse. He gave it the name ‘Neuhof’. Now he was ready to get married. Little by little Anna’s father yielded and finally agreed to them getting married. He, no doubt, persuaded her mother, and eventually she also gave her consent, although reluctantly. Anna was only allowed to take her clothes and her piano with her. Pestalozzi was forbidden to go and meet his bride at her parents’ house, as was the custom. Instead Anna had to walk alone to her bridegroom’s house. The wedding took place on the 30th of September 1769 in an old, small church. Only Pestalozzi’s family and one of Anna’s brothers were present. Anna’s parents did not come. At the wedding Heinrich Pestalozzi was twenty-three and Anna was thirty-one years old. The ‘Neuhof’ was not completed, so they had to move into an old, small farmhouse in the neighbouring village. Only one and a half years later were they able to begin their life together on the ‘Neuhof’. However, things turned out quite differently. Pestalozzi wanted to run the farm in the way that he had learnt from his master Tschiffeli. He cultivated sainfoin, a new green fodder plant, and he started the cultivation of madder. It is possible to make a red dye used to colour clothes from the roots of the madder plant. Pestalozzi was confident that he would be able to make a good profit out of these things, with which he wanted to help the poor. But to the other farmers in the area his methods looked unusual and funny. They did not trust this ‘city farmer’. They did not understand his new ideas. They trampled through his delicate cultivation as they were used to doing on their own meagre fields. They let their goats and sheep graze on his pastures. They said, “That’s what we have always done here. Every three years a field has to lie fallow.” If a field lies fallow it means that, in order to allow the soil to recover, nothing can be grown in the field that year. “In this year of fallow all the farmers may allow their animals to graze anywhere. That’s the way it has always been.” But Tschiffeli had taught Pestalozzi otherwise. He wanted to work the land every year. However the farmers felt that they were in the right. They did not care that the roots of the madder plant required four years to ripen. Pestalozzi wanted to explain it to them; this did not help. He put up fences; they were pulled down. In the end the matter went to court. The court ruled that the farmers had to stay away from Pestalozzi’s fields. Now they liked him even less. It was especially hard for Pestalozzi that the farmers falsely denounced him to his Zurich banker. This was why the banker wanted his loan repaid sooner than originally planned. It was the early summer of 1770. How could Pestalozzi pay back five thousand guilders? He had not even once harvested his crops. The carpenter had not even put up the roof of the new house. Pestalozzi’s mother helped out with what was left of her small savings. For the following two years the crops were poor throughout Europe. Pestalozzi’s plants did not do well either. He ran increasingly into debt. In 1774 he had to sell his cattle and lease a major part of the land. In spite of that, there were still heavy debts. Luckily Anna’s parents had become reconciled with their daughter. They paid the remainder of the debts. Then Pestalozzi tried the cotton trade for some time, which, as a citizen of the City of Zurich, he was entitled to do. He bought cotton in Zurich and had it spun and woven by the families of farmers. However, he was not a good businessman. Having people work for his own profit gave him a bad conscience. So once again, he operated at a loss. Pestalozzi himself was now as poor as the country people. Moreover there was something else bothering the couple. Three months after their bank credit was cancelled, Anna gave birth to their only child. It was a boy. The parents christened him Jean-Jacques and tenderly called him Schaggeli. Schaggeli was a sickly child. He had epileptic fits. Anna and Heinrich were constantly worried about his health. Pestalozzi took the risk. Just at the point when he himself had nothing left, he welcomed neglected children into his home. He borrowed money from friends and acquaintances. When that was not enough, he called upon the public to support his industrial school with a loan. He promised the moneylenders to pay the money back. He was absolutely convinced that he would earn enough money from the work of the children. 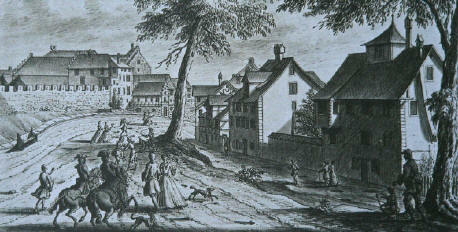 In 1774 the Neuhof gradually changed into a home and school for poor children. In 1776 there were twenty-two children living in Pestalozzi’s house and in 1778 there were thirty-seven. Pestalozzi and his wife fed and clothed them. They built a small, new factory and a children’s home for them. They hired skilled weavers and spinners, as well as people to work in the fields. These workers instructed the children. While the children were working at the spinning wheel or loom, Pestalozzi taught them to read and to do arithmetic. He wanted to be a loving father to them. Then Pestalozzi experienced another disappointment. Of course, many children came. They were pleased to be fed and freshly clothed. But rather than work regularly, they soon preferred to go begging again. Certainly, most of them learnt to spin and weave but as soon as they mastered these skills, their parents came to the workhouse and fetched them home, so that they could earn money for the family. As a result Pestalozzi was the one who got cheated. He always employed a lot of beginners but had few experienced workers. Of course, this was not profitable. Nevertheless, this did not curb his enthusiasm. He wrote detailed reports on every child. He also took on disabled children. He allowed a mentally disabled child, called Fridolin Mind, to draw to his heart’s content. Friedli, as they called him, always wanted to draw cats, always cats and nothing but cats. People later called him “Cat-Raphael” (after Raphael who was one of the most famous painters and lived five hundred years ago). Later on Fridolin Mind was at times even better known than his foster-father Pestalozzi! Pestalozzi saw a brother or sister in every human being. For him, man was God’s image. With the Neuhof, however, things went from bad to worse. Already two years later, it was again heavily in debt. The fabrics from the children’s workshop were, more often than not, badly woven. The buyers at the market laughed at Pestalozzi when he offered them his goods. He had to sell them at ridiculously low prices. Unfortunately, in 1776 and 1777, there were again crop failures, owing to bad weather. To pay the debts, Anna had to give up her inheritance. Two years later Pestalozzi had to sell a third of his land. He entrusted his brother, Baptiste, with the sale of the land. However when Baptiste had the money in his hands, he could not resist the temptation; he made off with the money and many months later wrote a letter to a friend in Amsterdam informing him of his whereabouts! He then joined a foreign war service and was killed. So Pestalozzi had to sell a lot more of his land and lease out the remainder. After that he had one of his worst experiences – maybe the worst of his life; he had to liquidate his industrial school. He had to send his beloved children back onto the streets. We can hardly imagine how this man felt at this moment. It broke his heart. The dream of his life was destroyed. He was close to losing his mind and could have ended up in a mental asylum; practically everybody deserted him. His neighbours made fun of him. His relatives did not want to see him any more, they did not want to be reminded of the money they had lost. His wife Anna was in poor health, due to the hard work she was required to do. She recuperated with a friend of hers, the young Countess Franziska in the Castle of Hallwil and was away for many months. Heinrich Pestalozzi was now alone. He could hardly afford food and firewood. All the same, his optimism did not altogether die. As mentioned, not quite everyone deserted him. There were two people who supported Pestalozzi in his time of greatest need. One day a young woman knocked at his door. Her name was Elisabeth Naef. She said, “I’ve heard that you need help. I’d like to help you in the house and garden.” Elisabeth was a simple servant with a good heart. For Pestalozzi she was heaven-sent. From then on she did all the housekeeping and tended the gardens. “There are still people who also think of others, not only of themselves. So, I’m not that abnormal”, Pestalozzi thought. Thanks to Elisabeth, he was able to regain his optimism. He pulled himself together and hoped to start anew. Pestalozzi followed Iselin’s advice and started to write. He wrote as if in a dream of all the good and bitter things he had experienced. He filled the empty pages of old account-books because he had no money to buy paper. 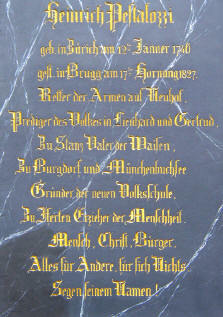 It was in the year 1780 that he walked to Basel with a pile of papers filled with his writing. There he met the beggar to whom he gave the silver buckles from his shoes as a present. Do you remember? Pestalozzi wanted to show the papers to Iselin. They contained the beginning of a long novel. It was called ‘Leonard and Gertrude’. In it, Pestalozzi wrote about life in the farming village of Bonnal; of corrupt people who cheated others, causing a lot of misery and injustice – just as Pestalozzi himself had bitterly experienced. He also wrote about Gertrude, a mother of seven children, a brave woman who, setting her children a good example, courageously stood up for justice. Pestalozzi read to Iselin and his wife from the pages he had written. Both of them were impressed. Pestalozzi described life in the village in a very lively and exciting way. 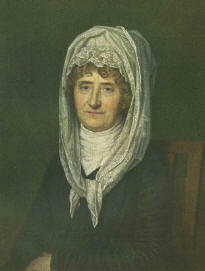 Iselin then devoted many Sundays to correcting Pestalozzi’s manuscript. Pestalozzi’s handwriting was rather hard to read and he made many spelling mistakes. With Pestalozzi, matters of the heart always came first. Head and hands were also important to him, but he often neglected them a bit. Above all else, he was a man with a good heart. In 1781 the first volume of ‘Leonard and Gertrude’ was printed and published. And lo and behold - the book became a ‘bestseller’, as we would say nowadays. All of a sudden Pestalozzi was famous. All over Europe people wanted to read his book. Within a short time it was translated into other languages. “At long last this useless Pestalozzi has found a way to make himself useful”, his relatives and acquaintances thought. They were relieved. Pestalozzi also began to believe in himself again, “I want to continue ‘Leonard and Gertrude’. It is obvious that this is the way in which I can make people understand my ideas.” So he then wrote three more volumes. Every two years another volume was published. However, Pestalozzi’s happiness did not last for long. He soon became aware that the people liked to read his fascinating story but that they did not take to heart the good that he wanted to achieve; they went on living as they were used to. It made him feel very sad so he sat down at his desk to write another book. The new book, ‘Christopher and Elizabeth’ (1782) explained the meaning behind ‘Leonard and Gertrude’ to the reader. However this book was too dull for most people. Only a few read it. For one year Pestalozzi published a weekly magazine, the ‘Schweizerblatt’. Only a few people bought it. His ideas were challenging and asked too much of people! Most of them did not want to change their comfortable lives. Amongst the many pamphlets that Pestalozzi wrote on political issues one was ‘On Legislation and Infanticide’ (1783). 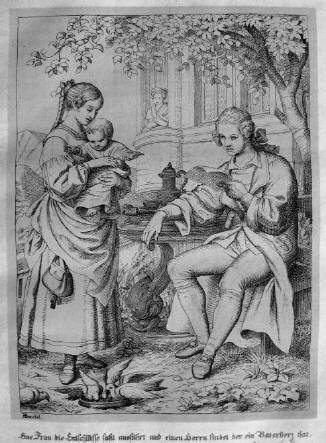 Pestalozzi blamed society and the economic problems of unmarried mothers for the frequency of infanticide and called for better, fairer legislation to solve the problem. Pestalozzi argued that laws should be introduced which support the mother rather than disgrace her, otherwise a woman may kill her child for fear of punishment and out of feelings of shame. Pestalozzi also wrote 239 ‘Fables’, which were published in 1797. Nearly all of these are very short and contain an important or original truth about morality, education, society or politics. Many of them are animal fables. A poor, vain fool whose fountain was almost dry, told his servant to stop the pipe when there was no one near, but to let it run on the approach of strangers. A rock, which for centuries had sheltered cattle from sun and rain, was crumbling with age. Day after day pieces broke off, and fell upon the animals, till at last they fled from the place where they had formerly loved to rest. But the old herdsman, half blind and half deaf, could not understand what had happened, and thought they had been bewitched by an enemy. It is sad to see the old shelters becoming dangerous ruins; sadder still to see the leaders of the people failing to understand the danger. A simpleton, seeing a hill covered with beautiful verdure, thought that it must be good earth right through; but a man who knew the place took him to a spot where the interior was exposed, and it was nothing but rock and gravel. The hills of the earth, however green and fertile they may be, have nearly always a hard, barren subsoil. Similarly, men, however noble in heart and mind, are seldom without strata of rock and gravel in the flesh. Some magnificent poplars and a few scrubby, undersized oaks grew by the side of the same stream. Simple Simon therefore concluded that the poplar makes good wood, and the oak bad. I know teachers who judge their scholars, pastors who judge their flocks, and rulers who judge those they govern, with no more reason than Simple Simon used to judge the merits of the oak and the poplar-tree. A shepherd, who fed his sheep rather poorly but all alike, found that, as a rule, they were satisfied. But one day he picked out a dozen for better treatment, and from that moment there was discontent in the flock, and many ewes died of vexation. The animals stood before Jupiter’s throne awaiting his decree, most of them believing and hoping that the elephant would be appointed. The lion had as domineering an air as though he were king already, but the elephant moved quietly to and fro with the greatest unconcern. King Lion one day asked his subjects what they meant when they talked of liberty. A man overheard all this and cried: “Surely none but animals can wish for this sort of liberty.” He was right: every wish for such liberty, fit only for animals, stifles in a man’s soul all true sense of liberty. The publications mentioned here are only a few examples of the enormous amount Pestalozzi wrote. 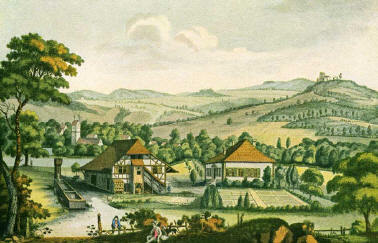 For 18 years Pestalozzi lived on the Neuhof without a steady job. After the initial success of ‘Leonard and Gertrude’ he soon felt idle and useless again. He had a wealth of good ideas and suffered because nobody was interested in them. Writing books seemed a poor substitute. He would rather have helped people with his own hands. He once wrote, “I would have mended your shoes. I would have hauled rocks for you. I would have drawn water from wells for you. I would have given my life for you. But you did not want me. So, all I could do was write.” During these 18 long years Pestalozzi came close to losing his faith in mankind. The people, it seemed to him, were selfish and evil through and through. At times he bitterly claimed, “You can drive out their wickedness only by harshness and force!” At a later time, he wrote about these difficult years on the Neuhof, “I lived like a man up to his eyes in mud and with his imminent death in front of him. I could have spat into the face of the whole world.” In this gloomy mood Pestalozzi saw his best years float past. Now and then he made a little money doing odd jobs. He took on work at home from a textile printing plant and occasionally worked on his farm. Moreover, a businessman trading in silk hired him as a manager because he himself was not a citizen of Zurich but needed someone who could do business in the town. Pestalozzi did not have much to do there but at least he drew a little income from it. In addition, Anna was able to make a little extra money working in the office of this company. On the Neuhof Pestalozzi had already become a grandfather. Jean-Jacques had married and taken over the farm. Pestalozzi felt old. He was already over fifty. Then, in the year 1798, something happened that was a turning point in his life. In the year 1789 the big revolution, the ‘French Revolution’, broke out in Paris, the capital of France. Throughout Europe there were laws, based on which the nobility and the higher clergy enjoyed special rights compared to the farmers, business people and craftsmen. This led to the simple people getting poorer and poorer. Therefore the people took up arms and demanded that all people should have equal rights. All should be safe from oppression. Yes, they should all live together peacefully, as brothers. The former masters resisted with all their might, and this resulted in terrible bloodshed. The King and the Queen were imprisoned, and later they were even beheaded. For a long time the situation in France was absolutely chaotic. Again and again different people rose to the top to govern the country. In the end, a man from Corsica, Napoleon, succeeded in seizing power. His goal was to create a new world order and to bring this revolution to the whole world. Switzerland was not spared Napoleon’s power politics either. In the year 1798 he marched into Switzerland with his soldiers and conquered the country. At first this was quite easy, as in Switzerland, at that time, there were many sorts of injustice. Therefore, there were many people who did not wish to put up any resistance against the French. In Switzerland, the rural population was not dominated by the nobility, but it was dominated by the cities. The farmers had fewer rights and were the only ones who had to pay taxes. Besides, the children of the farmers were not allowed to become clergymen, judges, civil servants, manufacturers or businessmen. Those occupations were only open to the citizens of the city. All this was indeed unfair. We have heard that Pestalozzi as a student had already protested against these conditions. A great many other people also protested against them. After the French had conquered Switzerland, they demanded equal rights for everybody. Up until this time, the individual towns and cantons were self-dependent, but Napoleon wanted to change this; the whole of Switzerland should have a uniform government and the same laws should apply all over the country. The most important laws were set down in a small book, which became the constitution. Switzerland was now called “The Helvetian Republic”. All the people in their villages and towns had to assemble and take the oath that they would comply with the laws in the new constitution. To begin with, there were many who were pleased with the new situation. Pestalozzi was one of them, although some of the things the new masters demanded were not to his liking. However most of the people were soon unhappy again. Certainly, the French said, “We bring you freedom” but in reality their main aim was to plunder the country. They stole all the gold from the treasury and transferred it to Paris on ox-carts. The farmers had to feed the French soldiers. Often the French just led their cattle away from their stables. However, the people of Nidwalden did not listen to Pestalozzi. They believed their own leaders and refused to take the oath. Then ten thousand French soldiers marched to Nidwalden. The people – men, women and children – fought with all available means, but the French were stronger. They set fire to the villages and many men, women and children lost their lives. A great number of children lost their parents. Pestalozzi was in great despair when he heard of this disaster. He immediately travelled to Stans, the capital town of Nidwalden. He wanted to help. He put a proposition to the government; that they should establish an orphanage in Stans. Three months later, the orphanage was completed and Pestalozzi was assigned to manage it. He was happy, “Finally I can do something for the people,” he thought. It was already December when he moved to Stans. There was a large convent in Stans at that time with enough room for the orphanage. 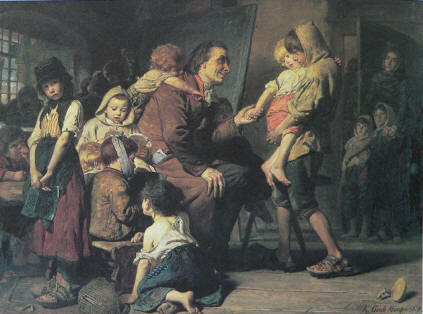 Pestalozzi immediately began to gather orphans. In January 1799 the orphanage was officially opened. Originally there were fifty beds, but by spring the orphanage already had eighty children. Pestalozzi wrote, “Many came with festering wounds on their heads, dressed in rags, full of lice. Many were skeletal, yellow, their eyes full of fear. Some of them were rude. A few were used to begging and conning. There were also delicate, pampered children. They were quite demanding and looked down on the children of the poor. Most of the children had never attended school. Only one in ten children knew the alphabet. The dream did not last long, as six months later Pestalozzi had to close the orphanage. 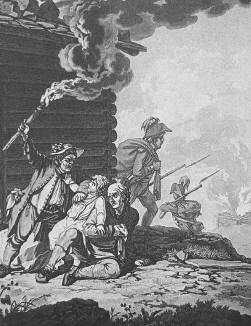 The war of the French against the Russians and Austrians was waged in the midst of Switzerland. The French said, “We need the orphanage to use as a military hospital. The orphans must move out. Once again, Pestalozzi had to give up a good project. All he could do was to give the children sufficient clothing and a bit of money… Then he was alone again. Maybe this saved him from getting ill, as he was completely overworked. This was the only time in his life that he granted himself a rest. He went to a spa in the mountains. Whilst there he contemplated how he could best help the people. That was in 1799. Pestalozzi was fifty-three years old. Once more, he started anew and became a teacher. Most schools in those times time were really bad. The teachers were not trained for their task. Most of them were discharged soldiers or craftsmen who needed an additional income. The teachers were poorly paid. There was still no compulsory education. The teacher stood before a class of about eighty children with a cane in one hand and a thick book, the catechism, in the other hand. This was a book of religion. The children did not understand what was written in it. The teacher spelt and recited it to them. The children had to repeat everything parrot-fashion. Woe betide the children who talked to their neighbour! They became acquainted with the cane. Such teaching was unnatural and artificial. Most children did not learn anything that they could put to good use. 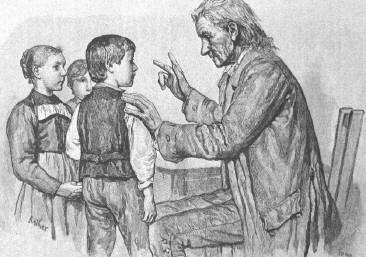 Pestalozzi got a teaching post in Burgdorf but he was not allowed to have a class of his own, he was only allowed to teach some destitute children in the corner of a classroom. The classroom belonged to the teacher and shoemaker Samuel Dysli. That looked very funny indeed: On the one side, in front of the pupils, there was Dysli with the cane and catechism in his hands; on the other side, there was Pestalozzi. Pestalozzi’s children were allowed to describe whatever they saw; the ripped-up wallpaper, the holes in the wall, the trees in front of the windows and so on. In this way, they learnt firstly to closely examine an object, then to talk about it in simple words, then to write about the object and finally to read what they had written. For this they were given slates to draw and write on. Pestalozzi’s lessons were lively and interesting and the children enjoyed learning. Dysli, the teacher, became jealous and suspicious. He told the parents of Pestalozzi’s children, “This man cannot read or write himself, otherwise he wouldn’t teach in such a ridiculous way. However, the worst thing is his faith, he doesn’t even use the catechism!” The parents believed Dysli. Pestalozzi had to leave Dysli’s classroom. However, his friends stood up for him so he was able to get another job. He was permitted to go on with his experiments together with a young teacher. Her name was Staehli. Now Pestalozzi taught the children of the citizens of the town. He wrote letters on small cardboard pieces; the vowels A, E, I, O and U in red and the consonants S, B, R, M and so on in black. With the help of the cardboard pieces the children could put words together. Pestalozzi also etched letters into transparent horn-leaves. The children could then put these leaves over the letters they had written themselves. In this way, they immediately saw whether they had written the letters correctly. These teaching methods were absolutely unheard of in those days. Nobody taught like that. After eight months the school authorities conducted a test on his class and the results were outstanding. Immediately Pestalozzi was given a more advanced boys’ class, which he was allowed to teach by himself. The City of Burgdorf lies on a rocky hill. At the top there is a big castle. In this Castle of Burgdorf the government wanted to establish a teachers’ college. They wanted to appoint Pestalozzi as supervisor of the college. At first he refused to consider the proposal. “I want to become a proper schoolmaster, before anything else. To begin with, I want to teach small children,” he said. Soon after, the supervisor of the college died and Pestalozzi moved up to the castle after all, taking his own class of pupils with him. A teacher with his twenty-six pupils from another part of Switzerland also enrolled. There was a war being waged where they came from, so the children’s parents were happy that the children could go to a part of Switzerland where there was peace. At long last, Pestalozzi could enjoy his great success. The school inspector wrote a report on Pestalozzi’s school. He enthusiastically praised Pestalozzi and said he was indeed a model teacher. He wrote, “Pestalozzi’s children learn in half a year as much as the children of other teachers learn in three years.” Pestalozzi’s good reputation spread all over. 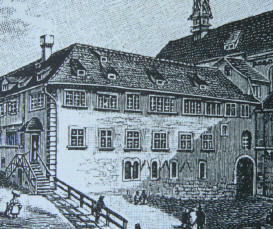 In the Castle of Burgdorf there was a boys’ school, a teachers’ college – plus a school for poor children. Pestalozzi carried out his old dream as soon as he could. To help the poor was always his particular concern. Of course, he could no longer manage everything by himself and now had several employees to help him. Moreover, groups of scientists and politicians from everywhere came to Burgdorf. They wanted to meet Pestalozzi and learn from him. Studying all day long was not the only activity in the castle. The pupils were also allowed to get out into the open air. They went climbing on the sandstone rocks, bathing in the nearby river and hiking all over the country, singing songs. Every evening they all gathered in the large assembly room of the castle. Pestalozzi was there, too. The students could tell him whatever was bothering them. He listened to them, encouraging or admonishing them. Together they asked for God’s blessing and then went to bed. When all was quiet in the castle, Pestalozzi sat down at his desk and worked at his new book, ‘How Gertrude teaches her Children’. In it, he wanted to show how to bring up children. His opinion was that all children have the right to a proper education, appropriate to a child; that once the schools became good, nobody would have to suffer poverty any longer. Pestalozzi’s book became widely known. He was now considered a great educator and a school expert. In Burgdorf Pestalozzi, at long last, had his family with him again. His wife, Anna, came and assisted him. In 1801 his son Jean-Jacques died, at the early age of thirty-one, but his daughter-in-law with his grandchild, Gottlieb, and Elisabeth, the maid, moved from Neuhof to Burgdorf. Even though Pestalozzi’s institution in Burgdorf was so famous, he had no luck there, and had to give it up. 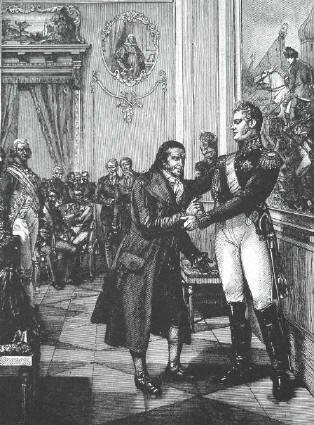 In 1803 Napoleon removed the Swiss government, which had supported Pestalozzi, and made the cantons independent again. Now each canton could make its own laws, as in former times. The City of Burgdorf belonged to the Canton of Bern. The Bernese government did not approve of Pestalozzi and gave the castle to the new district magistrate as his official residence. So the order came from Bern that Pestalozzi had to clear out of the Castle of Burgdorf by the 1st of July, 1804. For all that, the Bernese government did not want to just turn the famous Pestalozzi out onto the road. They left him an old, dilapidated convent in Münchenbuchsee to use for a year. There, as the situation allowed, he settled down for a short time with his students and co-workers. Near Pestalozzi’s institution, in Hofwil, there was another educational establishment. The proud Bernese aristocrat, Philipp of Fellenberg, supervised it. Fellenberg was an excellent manager. Pestalozzi’s co-workers thought that Pestalozzi and Fellenberg would together make a good team. Pestalozzi had the good ideas and the big heart, and Fellenberg was the born organiser and ensured orderliness. They suggested this idea to the two men. They tried it out for a while but they did not get along for very long. Fellenberg said, “We can’t take on pupils free of charge.” Pestalozzi did not agree with him. It was the poor children he wished to help. For this reason he decided to leave Münchenbuchsee. Then he got a proposal from the Czar of Russia, Alexander I: Pestalozzi could become a professor in Russia and reform the Russian schools. The offer was tempting and Pestalozzi came close to accepting it. His relatives warned him, “You don’t know Russian and you don’t know the country.” He may have gone, but he then received an offer from his own country, from the Canton of Waadt, which had belonged to Bern before the revolution but was now independent. 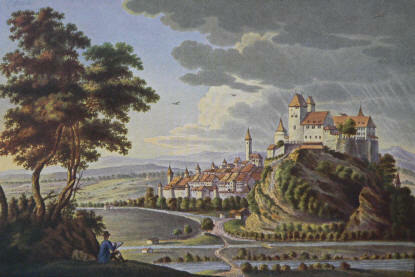 The Canton of Waadt promised Pestalozzi the Castle of Yverdon on the Lake of Neuenburg, rent-free for the rest of his life. Pestalozzi could carry on his educational institution there. In 1804 Pestalozzi, together with three teachers, left Münchenbuchsee. They moved to Yverdon and planned to start anew there. Pestalozzi doubted himself. “I’m already 58 years of age,” he thought, “In Stans I had to leave, in Burgdorf they dismissed me, and now in Münchenbuchsee things have gone wrong again. Will I ever succeed in anything?” Then he experienced something very strange, almost a miracle. It was an evening in October. Pestalozzi took a walk through the vineyards. It was foggy, and one could not see far. Besides, he was lost in thought as he quite often was. All of a sudden, two trotting horses emerged out of the fog. He wanted to let them pass, one to the right and one to the left. At the very last moment he noticed that it was a wagon, but it was too late. The shaft threw him onto the ground, and he landed under the horses’ legs. In seconds the wheels of the wagon would run over him. Then, with youthful strength, he did not know how, he swiftly rolled to the side, between the legs of the horses. The heavy wagon rumbled by. Pestalozzi got up and looked at his clothes; they were torn on the sleeve and the body, but he himself was unharmed. He was astonished that his heart was not beating even faster. The sudden danger to his life had brought about a calm and strength in him, in a way he would not have believed possible before. He wondered, “How did I do that?” At once, his inner voice gave him an answer, “No, it’s God’s doing!” After this experience, Pestalozzi once again believed in himself and trusted in God’s help. 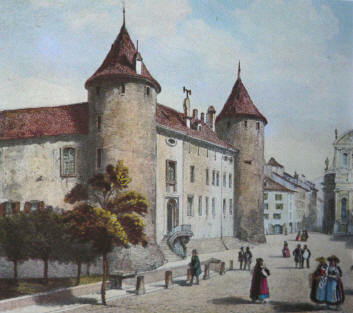 Pestalozzi’s boys institute in the Castle of Yverdon soon became world-famous. In Germany, France, Italy, England, Russia and America people studied Pestalozzi’s books and enthusiastically admired him. The initial five years in Yverdon were the best. More than one hundred and fifty boys between the ages of seven and fifteen, about thirty teachers, thirty college students who wanted to become teachers, and Pestalozzi’s family, all belonged to the community in the castle. In addition, Pestalozzi ran an institute for girls in the City of Yverdon. In those days, boys and girls were educated separately. The students were mostly taught in groups. Each group decided individually in what way and how fast they wanted to work. The teachers acted more as assistants. Students who had grasped a problem were immediately put into action as teachers of their classmates. There were about three times as many lessons as today; a full sixty hours a week was spent at school and holidays were non-existent. Instead, there were many hiking excursions for the pupils, which often lasted several weeks. Teachers and pupils hiked in the local mountains or in the neighbouring countries. By thoroughly preparing these hiking trips together the children learnt geography and natural science in a very practical way. Pestalozzi said, “Learning from books is a cheap substitute. It’s a much better idea to look at things directly in the open air.” In addition, the teachers often took their classes outdoors, where they studied plants, animals, landscapes and rock formations, describing them and drawing sketches of them. Often the teacher just said a word, such as ‘dandelion’ or ‘squirrel’; then the pupils had to find out all about it. Otherwise, the children in the institute had the same subjects as we have today: Mathematics, German and French, History, Drawing, Gymnastics, Singing, Religious Instruction, plus Latin, Bookkeeping and Correspondence. Of course, they had no computer science and no typing, as there were neither computers nor typewriters at that time. Handicraft and housekeeping were not subjects on the timetable. But, as everybody knows, Pestalozzi kept repeating that the head, the heart and the hands are all important. Outside the school the children learnt to work with a hammer, a saw and a plane and were even allowed to work at the lathe. They also helped in the house. The institute owned its own printing office and bookbinding shop, in which the children could take an active role. They were allowed to ‘snoop around’, exploring and helping in the workshops of the carpenters, the mechanics, the watchmakers and the turners of Yverdon. In the institute they kept rabbits and sometimes lambs and also took care of their own garden beds. Sports and games were also important. When the children were not working, they played games and enjoyed themselves. The children were often given permission to go bathing in the Lake of Neuenburg and all of them learnt to swim. In winter they built tremendous snow castles and, when the lake was frozen, they could go ice-skating. Pestalozzi liked them to be out in the healthy, fresh air as much as possible, even in the bitterest cold. Every day was open house for the parents of the children of Yverdon Castle. Pestalozzi was pleased to have visitors and welcomed them in person. They were welcome at any time, in all the classrooms. The class teachers had to inform the parents regularly, in writing, on the progress of their child, though not in marks. In no way did Pestalozzi want school reports to include marks. He said, “No child is to compare himself with others. Each of them is to assess himself only by his own capability and achievements.” There were children in the institute with various talents. 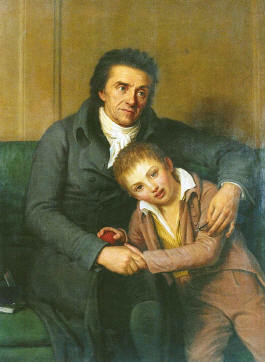 Pestalozzi also took on children with emotional problems. He even opened a section for children who were hard of hearing. The institute never became rich. Pestalozzi asked for much lower school fees than other institutes. In addition, he accepted children of poor parents at no cost. Every third child did not pay. The teachers worked for practically no wages, only for food and lodging. To them working for Pestalozzi meant far more than money. At times the institute had one common cashbox for everybody. The teachers could help themselves when they needed something and the pupils could ask for it when they needed money. This could have been wonderful except that nobody was really responsible for the money; as a result the institute had money problems over and over again. The community was like a large family. The teachers took their meals with the boys and slept in the same rooms. All of them enjoyed great freedom. To be sure, there were important regulations in the castle. These were: Nobody is to be ambitious and think they are better than others. Nobody is to be dishonest and flatter others. Nobody is to insult others or hurt them. The teachers must not use corporal punishment. Once a Latin teacher hit a student on the head with a book. Right away two students ran to the headmaster – that was Joseph Schmid - and complained. Schmid commended the boys for their courage and dismissed the teacher. Pestalozzi himself did not teach any more. He was the father of the family. He wrote a lot and received the numerous visitors. He talked to any student who seemed to be worried about something. He worked with individual students to further their particular talents. Every day he addressed the whole community with a few words. On festive days he made his famous official speeches, which you can read in his books. Every week the teachers had to present each child to him and report on the progress made. It was the emotional progress of the child, the heart, that interested Pestalozzi the most. He said, “The main thing is not the accumulation of knowledge and know-how. The most important thing is to develop into a genuine human being; the essential thing is love.” Pestalozzi himself was a living example of this as he radiated an indescribable feeling of love. He gave everybody entering the house a hug as if they were his own brother or sister. The pupils and college students loved and honoured him. Big as Pestalozzi’s heart was, he continued to be a bit clumsy with his hands throughout his life. In 1812, lost in thought, he poked in his ear with a knitting needle. All of a sudden he pierced through the eardrum and seriously hurt himself. He was confined to bed for four months. In 1984 his skeleton was exhumed near the school in Birr (close to the Neuhof). There, behind the ear, a small hole in the skull could be made out. Obviously, the doctors had had to drill this hole in the skull to save his life, all without anaesthesia! In 1813 the same misfortune suffered by the orphanage in Stans threatened the boy’s institute. Napoleon’s time came to an end. The Russian, German and Austrian armies pushed the French back. The war was fought in Switzerland as well. Again foreign armies were stationed in Switzerland. The word was that a military hospital would be set up in the Castle of Yverdon. Without a moment’s thought, Pestalozzi travelled to Basel where the headquarters of the allied sovereigns of Russia, Prussia and Austria were located. Czar Alexander I had a high opinion of Pestalozzi. He received him for talks. Standing before the Czar, Pestalozzi forgot why he had come. Instead, he started to talk him into abolishing serfdom in Russia. He told the Czar that he should build schools, so that the millions of peasants could learn something. Pestalozzi got very heated about it; he approached the Czar, grabbed his uniform and was about to shake him to persuade him. The Czar gently pushed him back. Pestalozzi simply asked too much of him! After all this, the institute was permitted to remain in the castle and the soldiers took up their quarters somewhere else. During these war years the number of pupils dropped drastically and the institute almost went bankrupt. Once again Anna, Pestalozzi’s wife, had to help out. She was able to save the institute with money from an inheritance. In other respects as well, Anna Pestalozzi played an important role. She had what Pestalozzi lacked; a calm, well-balanced nature. Anna was an island of calm in the house. Everybody appreciated her as a housemother and felt fortunate to have her. In 1815 Anna died at the age of seventy-seven years. This was a painful loss for Pestalozzi and the institute. Anna had not only frequently saved her Heinrich from financial disasters, but had repeatedly helped him with his bold projects, although she would have preferred a quiet family life. Now he was all by himself. This scared him a bit, but he believed in himself and his mission. He prayed to God and found new strength. Pestalozzi’s misfortune remained with him. To be sure, the Institute in Yverdon was world-famous. After all, it existed for twenty years. That was for longer than all the other projects in Pestalozzi’s life. But the Institute in Yverdon also came to an end while Pestalozzi was still alive. Pestalozzi was honest enough with himself; he knew that the fault was mostly his own. He did not have sufficient practical skill. He had fantastic ideas, and he knew exactly what was missing in the world – but to many people his way of speaking was too complex. He loved all his fellow men from the bottom of his heart – but to organise things, to manage and to guide people, to run a business efficiently, that was what he was not good at. It was this very flaw in his character that was his undoing in Yverdon. For the teachers in his institute Pestalozzi was a great model of humanity. But in practical life he set no example for them. He trusted them entirely and let them do what they wanted. Not all of them were as generous as he was. Two of them were particularly dear to his heart, and he thought of them as his own sons. Their names were Josef Schmid and Johannes Niederer. These two had an irreconcilable quarrel. Each eventually wanted to become Pestalozzi’s successor. Ambition had them in its grasp. Each of them thought he was the best manager for the institute. They forgot what Pestalozzi kept saying: “Nobody should believe himself to be better than others.” Their hearts grew hard. They began to hate one another. Soon they infected others with their jealousy; some were for Schmid, others for Niederer. Relations in the institute became poisoned, with the teachers blaming and even insulting each other. In 1816 Niederer, together with sixteen teachers, left the institute. In spite of this, there was no peace; Niederer now wrongfully accused the institute wherever he could and also talked badly about Pestalozzi. For years he claimed that Pestalozzi owed him a lot of money. He even took Pestalozzi to court. Pestalozzi was acquitted by the court but Niederer did not give up until Schmid had to leave the institute as well. The quarrels among the teachers destroyed the good reputation of Pestalozzi’s institute and in 1825 he had to close it down. Now, at the age of 79 Pestalozzi retired to the Neuhof for good. His grandson, Gottlieb, had been working the farm for a number of years. Pestalozzi still stuck to his idea of a home for poor children, where they would also be able to work and get an education. Together with Gottlieb he started out to construct a new building for this purpose. In the middle of winter, the eighty-year-old man hauled rocks to the place, but he did not survive to see the completion of the building. Pestalozzi’s life often took a sad course. It also ended sadly. Johannes Niederer could not get over his blind hatred for Pestalozzi. He instigated a young German teacher, named Eduard Biber, to write a book in which he called Pestalozzi a hypocrite and a criminal. “Pestalozzi’s books and his institute are a load of trash,” he said. The book was published in January 1827. On the 12th of January, 1827 Pestalozzi celebrated his 81st birthday. He was still in the best of health. Shortly afterwards Biber’s book fell into his hands. It offended him so much that he fell seriously ill. He wanted to defend himself against the lies that Biber spread, but he was no longer able to do so. Passing his pen over the paper to write, he did not realise that there was no ink left in it. Pestalozzi’s last wishes did not remain a fantasy; Eduard Biber kept busy studying Pestalozzi’s life and achievements. He converted from being an enemy into being a great admirer of Pestalozzi. He devoted his whole life to Pestalozzi’s ideas and tried to establish them in the schools. Two days after his death, Pestalozzi was buried near the school in Birr. This is what he had wished for. In spite of the enormous quantity of snow, a great number of adults and schoolchildren from the neighbouring villages followed the coffin. Teachers carried it, and at his grave they thanked him with a song. According to his wish a white rosebush was planted on the grave.